Well hello there, I’m James. 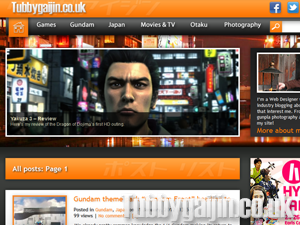 I started this site in Early 2008 mostly to write about Gunpla and my days out. 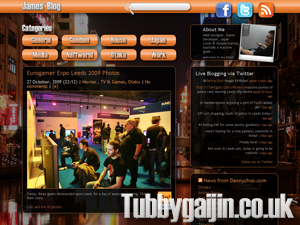 I’ve had sites for years, including the long forgotten webcomic “Naffworld” but this was my first jump into wordpress. 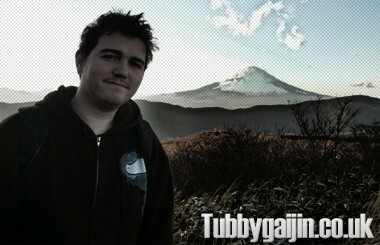 I first visited Japan back in 2007, and I now live in the Kansai region where I teach and do freelance design. During my third trip in Christmas 2009 I got married in Kyoto on Christmas Eve. I’ve applied to teach in Japan through the JET Programme three times. First time I wasn’t selected for interview, and the second I made it all the way to the Alternate list but didn’t receive an upgrade, and my final attempt was back to no selection. I’ll always be a little disappointed I didn’t get a chance to prove myself as I’m sure it would’ve been a great experience. I have a broad range of interests, and to that end there’s quite a mix of posts here, from Japan-related photography and developments, to urbexing, video games and Gundam. My wife also blogs, check her out at teatwosugarsplease.wordpress.com/. 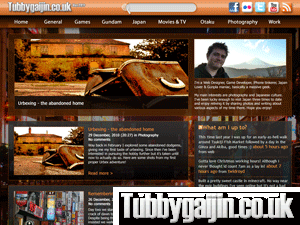 Thanks for visiting, hope you enjoy the site and please feel free to leave comments! 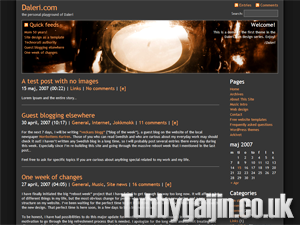 As I had no prior experience with WordPress, I opted to use a pre-made theme – namely Daleri Dark by Andreas Viklund. I happily continued adding to this for some time, and elements including colour scheme and font continue to influence later designs. A further improvement to V2, adding a slider to the homepage and excerpts to make sectional browsing easier. V4 – 2012 — ???? An evolution of V3. Much of the underlying code of the site hadn’t changed since 2008 meaning the site was heavily reliant on hacks and plugins. No more! A nice new slider system and native thumbnails and threaded comments should speed things up a bit. The colour scheme has gone alot brighter compared to the muted, slightly mucky V3 and pages for the first time are presented on a white background for ease of reading. I’ve been trying unsuccessfully to send an email to the account listed on your Gaijinpot resume. I’d like to respond to your application for the position we’ve advertised as an English instructor, with a view to setting up an interview. Could you please write back to me at the address I’ve registered here? I’m writing from a television production company based in the UK. We’re currently making a series about international street food and are looking for food obsessives based in Osaka who could show our presenter around when we come out to film in February. I came across your burger quest so thought I’d get in touch! Even if this doesn’t sound like you I’d love to hear if you have any friends or contacts in Osaka who are food bloggers, food tour guides etc – essentially any English speakers who really have their finger on the pulse of the Osaka food scene. I look forward to hopefully hearing from you! Hi Caroline, this sounds great! I’m going to drop you an email shortly! Nice blog! I just watched some of your YouTube. All this makes me wanna go to Osaka for food and drink! Thanks, Sir! You definitely should, the food here is great, and pretty cheap! Given our common connection to Japan, I was wondering if I could provide you with a copy of my new book – American MaleWhore in Tokyo – and if you get some good laughs out of it, I’d be grateful for a shout out. It’s a juvenile/explicit comedy that sheds light on Japan and its culture in general as well as the dazzling yet seedy culture of host clubs. I’m sorry that this message is out of place here but unfortunately I couldn’t find any contact info for you. As I don’t want to be spammy, please delete this after you read it. We quite enjoy your blog about living in Osaka, it is very interesting and informative. Would it be possible to interview you to further share some of your tips and feature some of your first hand experience as an Expat and your interview will be published on our Expat Interview section as a guide for our expat readers. The questions are mainly about the day to day lifestyle of an expat. If it would be possible, could you also send some photographs that we can use? If you are interested and would like a free issue of the e-book, then send me your email address and I will get one to you right away. My name is Joe Pinzone and I’m casting an international travel show about expats moving abroad. We’d love to film in Japan and wanted to know if you could help us find expats who have moved there within the last 15 months or have been there for 3-4 years, but recently moved into a new home. The show documents their move to a new country and will place the country in fabulous light. The contributors on the show would also receive monetary compensation if they are filmed. If you’d like more information, please give me a call at 212-231-7716 or skype me at joefromnyc. You can also email me at joepinzone@leopardusa.com. Looking forward to hearing from you.